Which came first, the architect or the collector? How does art influence architecture? Should a home be designed from the outside in, or the inside out? Barry Berkus was a Santa Barbara-based architect with a great passion for art and a keen sense of civic responsibility. 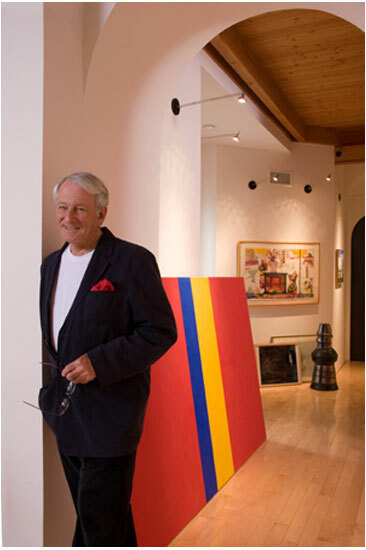 He donated a major portion of his collection to the County of Santa Barbara to make art familiar and accessible. Whether designing a home, a medical building, or a busy bus stop, Mr. Berkus’ work involved a dialog with those who will use the structure and reveals an artist who finds parallels and connections. Mr. Berkus believed that “behind every wall is another experience that may enrich life’s journey.” Barry Berkus’ documentation took place in 2007 and was co-sponsored by Cherie and John Brant and Yvette and Richard Franklin. The FOTM Archive contains extensive information about this artist.